Creativity 521 #40 - What's the time now? "You have five minutes to get ready." "It's nine o'clock, we are going to be late for school." "We missed the bus. Now we have to wait for another ten minutes." "You've been eating your dinner for one hour already, you know that?" Have you ever said the above lines to your child, whether knowingly or unknowingly? I have. In fact, I say them almost every day. The thing is, will a four-year-old be able to grasp the concept of time and understand why I am rushing her or why she needs to eat faster, when I have not done much to teach her about time in the first place? In the past few months, it seems like Angel has developed a fascination for clocks and time, like when we are going to bed, she will take the alarm clock and ask me "What time is it now, Mummy?" or she will take a look at the digital clock on my mobile phone, try to read the numbers and say things like "It's now two, four, seven." It made me realise that before I use the clock as a means to encourage her to get things done, I'd better do my part and teach her to first tell the time and at the same time, explain why time is so precious and why we should make the most of every moment. 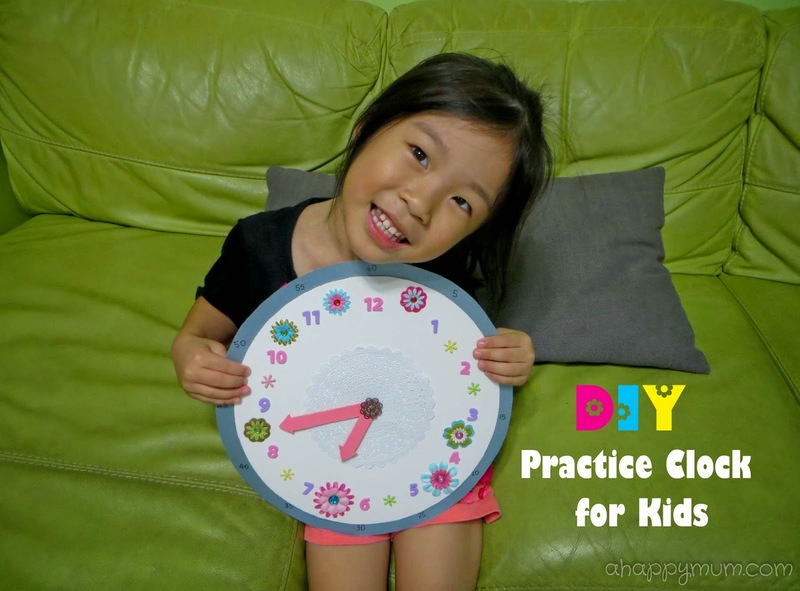 In today's Creativity 521, I'm sharing with you our simple DIY Practice Clock for kids. We are ready to begin! The circle for the clock was traced on the cardboard using a dinner plate and cut out. The hour and minute hands were measured to fit the circle nicely, drawn in the shape of arrows and then cut out. We also painted them pink to make them stand out. Next, determine the centre of the circle and make a small hole with the penknife. Well, for the lazy me, I estimated the centre by drawing a couple of diameters, found the intersection point and measured a few radii to be sure. If you want to be geometrically correct, you can learn how to do it here. Poke a small hole through the arrows and the doily. Using a brad, secure them to the centre of the circle as shown above. For those who don't know, brads act as paper fasteners and you insert both the prongs of the brad into the paper, turn around and separate the prongs to secure it. I find this the fastest and best way to make the hands of the clock movable and since we have many floral scrapbooking brads at home, we decided to make a flower clock using just the brads. For the doily, I thought it gave the clock a nice finish and was a pretty embellishment that would spin around when you move the hands. Then, it was Angel's turn to do up the clock! Although she needed my assistance to poke holes for the brads, she could finish the job of securing them and she was also the one who designed and decided on the placement of each of the brads for the clock. We started out by pasting the foam stickers for the numbers on the clock. Once you get 12, 6 and 3, 9 in place, the rest becomes easy. You can also use any numeric stickers (Popular sells them) that you can find, print them out from the computer or write them if you wish. Initially, I thought it would be nicer to just place a few flowers but my girl decided that she wanted one flower at every interval and wouldn't stop until she made sure this was achieved. Well, it's her flower clock after all, right? Tip: When you are adding the embellishments, always make sure that the hands can move around freely. Ta-dah! Here we have it, our first DIY floral practice clock! Woohoo! Since this is a start for her, we decided not to add minute intervals but as a guide, I cut out a bigger circle from the scrapbooking paper and stuck it behind the clock so that I could write the minutes represented by the 12 numbers as shown. You can choose to glue it down or if you are like me and hope that one day you can remove this border and your child can read the clock as it is, just use my ultimate favourite adhesive - Blu Tack. Now, we are all set to start learning about TIME! Judging from how it took her days to remember that one hour has 60 minutes and that she can only count up to 29, I guess we have a long way to go! 1) Teach the 5 times table (5, 10, 15, 20 and so on) to help the child conceptualise the minute hand of a clock. 2) Tell the child this is a 12-hour clock, explain about AM vs PM and why there can be two 8 o'clocks in a day. 3) Explain that the short hand is the hour hand and long hand is the minute hand. Start by teaching that at any time the minute hand is pointing to 12, it is __ o'clock. 4) Demonstrate how the hour and minute hand work and move together. Be imaginative and use stories for instance the minute hand is the hare, the hour hand is the tortoise and how the minute hand will always run faster. 5) Talk about things that you do every day and show the times at which they occur. Like waking up, going to school, lunch, nap, dinner, story time and bedtime. 6) Quiz each other. Don't make the child answer all the questions, take turns to let him/her determine where the hands stop and ask you "What time is it now?" 7) When the child is more ready and confident, get him/her to write down timings in digital form on a piece of paper. Then, ask him/her to show them on the analog clock. 8) NEVER make this a chore but a fun learning experience instead. If the child is not interested and simply cannot understand the concepts, leave the clock aside and bring him/her to the playground instead. Be patient and wait for another chance to explain it or come up with games to make it more appealing. 1) Maths-aids time worksheets here. 2) Free printable standard clock with minute intervals here. 3) Draw the clock hands worksheets here. 4) A fun activity journal to learn time by Beanie N Us here. 5) 'Beat the Clock' game for preschooler to learn about time by Gingerbread Mum here. 6) Giant DIY clock tutorial by Princess and The Rock here. So, what's the time now? 2:01am. Yes, it is. Time for me to go to bed! Happy weekend, people! Haha I know, Angel doesn't understand the duration too and I always have to remind myself that when I am trying to rush her. It's fun to learn about time together! Thanks for linking up, Ai! Welcome, Rach! Love the linky party idea! You are right, this clock is so much more precious to her than if we had bought a toy one and hopefully she will be more interesting in learning about time. I agree it is a pretty complex concept, I have difficulty explaining some stuff to her in layman terms and I seriously doubt if she got what I was trying to say. Haha. Thanks for the kind comment! The clock is so pretty and I love how DIY-ing the clock involves Angel. Definitely something I want to try out with Kaitlin. Thanks Bev! It is very easy to make, I am sure you and Kaitlin will have lots of fun learning about time together too!